The Institute of Biomedical Science (IBMS) Congress is a three-day conference that is held biennially in the Birmingham ICC, and hosted by the IBMS. The conference is filled with fascinating lectures that cater for a number if biomedical disciplines, there are short paper presentations, workshop groups, poster competitions, trade stands (with bundles of enticing free swag), and most importantly some great out-of-hours social events. I absolutely love Congress, and this year I decided to enter into the poster competition. At first, when I submitted my abstract, I wasn’t sure if I’d get accepted because I wasn’t presenting anything like a research project, I was making a poster about this very blog!! I wanted to show how blogging about my profession (which is histology, by the way) helped me significantly progress in my understanding of the subject as well as giving me the confidence to teach others. I also wanted to show how I was using my histology-based blogposts as a form of evidence for my Continuing Professional Development (CPD) portfolio. All very subjective, I hear you say, and that’s what concerned me about my application into the competition. Well, a few months later I received an email from the IBMS congratulating me on being successfully selected for the poster competition. Brill!! So, I presented it….and I actually won in the Education category!! I was ecstatic. Special thanks goes to Chris Hilton for helping me make my design look far better than I ever could have imagined. Also, if you’re interested, you can check out all the 2013 IBMS Congress winners of the Poster and Short Paper competitions here. Awesome! And congratulations! This is really great to see–the acceptance of the poster and the winning, not just the poster itself! Thanks, Gavin. I’m still over the moon about it and really can’t believe it. It was so much fun. It’s a beautiful looking poster, but more importantly such a great idea. Well done for getting CPD credits for it and kudos to IBMS for recognising the value of blogging. I was so pleased about the recognition from the IBMS. Combining studying and teaching with something I do for fun: blogging, and getting professional rewards from it, is just brilliant. This is amazing Della! 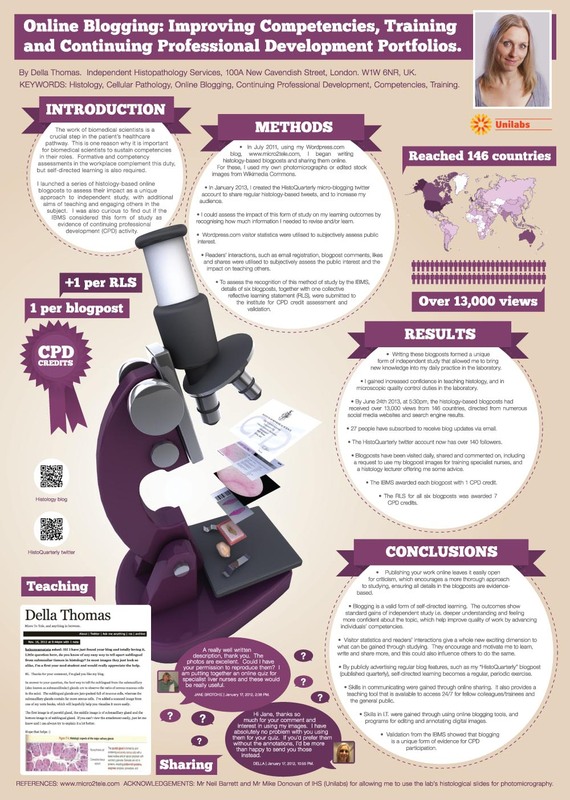 I think we all take blogging for granted – but this poster shows what a powerful tool it is. I bet this really stood out for the judges at Congress. Nice one, Well done and congratulations!! Hats off to Chris Hilton too. Thank you. I’m still buzzing from Congress and it’s given me yet another boost in motivation. So many ideas, just not enough time….you know, the usual!! I’m also so lucky that my other half (Chris) had all the programs I needed to make this poster. I couldn’t have done it without him.